September 30, 2014: Our show opens at Galatea Fine Art in Boston's South End this Friday, October 3, 2014. It's First Friday, so come check out our work - then go check out several other shows in the same big 450 Harrison Ave. arts complex! For more information, click here. September 28, 2014: Here's a photo of Jason's Boston Strong? installation at the Grove Hall branch of the Boston Public Library. It was pretty much the perfect place to show it. September 24, 2014: Just in time for our Grove Hall closing event tomorrow evening, here's the video of our April 15 Community Opening. Enjoy! August 26, 2014: The second iteration of the Boston Strong? exhibition - featuring work by Shea Justice and Jason Pramas - is running from August 25 to September 25, 2014 at the Grove Hall branch of the Boston Public Library! 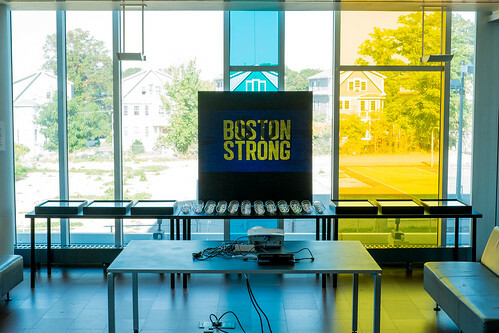 Closing event on September 25 from 5:30-7:30 p.m.
April 23, 2014: The first iteration of the Boston Strong? exhibition at Community Church of Boston, April 15-22, 2014, was a success and now we're working on taking the show to other venues in the Boston area. Please check this site periodically for updates and information. And be sure to go to our blog page to check out the press we got. Thanks for dropping by! Three artists - Darrell Ann Gane-McCalla, Shea Justice, and Jason Pramas - will be holding an art show called Boston Strong? from April 15-22, 2014 at the Community Church of Boston Lothrop Auditorium, 565 Boylston St., 2nd Flr. - one block from the Boston Marathon finish line in Copley Square. The exhibition is co-sponsored by the Community Church of Boston, and is free and open to the public. April 18, 2014, 6-10 p.m.
We're also working on hours for Tues., April 22 and possibly extending the run of the show due to popular demand. In addition, the exhibition may be viewed during any scheduled church events for the run of the exhibition. The purpose of the show is to spark public discussion and debate about the meaning of the popular "Boston Strong" slogan. The artists contend that there is a disparity between media coverage of the Boston Marathon bombing victims, many of whom are white and live outside Boston, and media coverage of the victims of ongoing criminal assaults around Boston, many of whom are people of color and live in the city. Over 40 people have been killed in Boston, mostly by guns, since the Marathon bombing. But there is no One Fund for those victims, and little serious talk of ameliorating the poverty that causes crime in Boston's working class neighborhoods of color. Banner photo by Jason Pramas. Copyright Jason Pramas 2014. All Rights Reserved.